I realize that we’re in the midst of an important tax battle in Washington and that I should probably be writing about likely amendments to the Senate tax bill. The bad Rubio-Lee proposal to increase refundable tax credits (i.e., redistribution spending that is laundered through the tax code) and “pay for” that additional spending by increasing the corporate tax rate. The very good initiative from Senator Rand Paul to repeal the awful Foreign Account Tax Compliance Act (FATCA). But long-time readers know that I’m bizarrely preoccupied by international tax issues (I would argue for very good reasons since global tax competition is a way to discipline greedy politicians and because I want the power of governments to be constrained by national borders). So I can’t resist commenting on a Washington Post story about the tax implications of the upcoming wedding of Prince Harry and Meghan Markle. It may seem like a modern fairy tale, but the upcoming wedding of Britain’s Prince Harry to American actress Meghan Markle will come with some mundane hurdles. Perhaps most inconveniently for the British royals, this transatlantic partnership could end up involving the United States’ Internal Revenue Service. Most readers probably wonder how and why the IRS will be involved. After all, Ms. Markle no longer will be living in the United States or earning income in the United States after she marries the Prince. But here’s the bad news (for the millions of Americans who live overseas, not just Ms. Markle): The United States imposes “worldwide taxation,” which means the IRS claims the right to tax all income earned by citizens, even if those citizens live overseas and earn all their income outside of America. 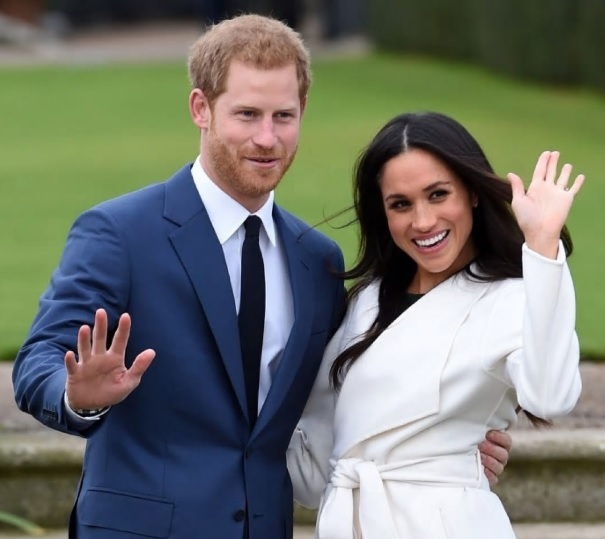 …there already has been widespread speculation that the union of Prince Harry and Markle eventually could result in some British royal children wielding American passports. But there’s a big obstacle in the way: American tax laws. …The United States’ citizenship-based taxation system is unusual: Only Eritrea has a similar system. It’s a relic of the Civil War and the Revenue Act of 1862, which called for the taxing of U.S. citizens abroad. Here’s what this means for the royal family. Markle’s American citizenship could open up the secretive finances of the royal family to outside scrutiny. If she remains a U.S. citizen, Markle will have to file her taxes to the IRS every year. And if she has more than $300,000 in assets at any point during the tax year — a likely scenario, given her successful acting career and her future husband — she will be expected to annually file a document called Form 8938 that will reveal the detail of these assets, which could include foreign trusts. …Although Markle’s tax information would not become public once sent to the United States, it would leave the royal family open not only to IRS review but also the risk that the information could leak, said Dianne Mehany, a tax lawyer at Caplin & Drysdale. So what’s the solution if the royal family wants to avoid the greedy and intrusive IRS? Ms. Markle will need to copy thousands of other overseas Americans and renounce her citizenship. …the royal family employs some of the country’s best tax consultants. …”My guess is that she’ll be pressured by the Royal family to renounce [her U.S. citizenship], even if she’d rather not,” Spiro added. In many ways, that solution may be the simplest. And if Markle does give up her citizenship, she won’t be alone. Treasury Department data show that 5,411 people chose to expatriate in 2016 — a 26 percent year-over-year increase and potentially a historic high — and experts expect that number to keep rising because of the increasing tax burdens placed on U.S. citizens living abroad. And it’s embarrassing to acknowledge that the United States has a very barbaric practice (used by evil regimes such as Nazi Germany and Soviet Russia) of extorting funds from Americas who are forced to give up citizenship. She…would be subject to a potentially considerable exit tax. This is adding injury to injury. But Ms. Markle can be comforted by the fact that she’s not an outlier. Because of America’s bad worldwide tax regime (and especially because of FATCA, which makes enforcement of that bad system especially painful), an ever-growing number of overseas Americans have been forced to give up their citizenship. Maybe as a wedding present to Prince Harry, American politicians can junk America’s terrible worldwide tax regime. That doesn’t require dramatic change, but why not fix a bunch of problems at once? I’ll simply point out that the flat tax is based on the common-sense approach of territorial taxation (governments only tax economic activity inside national borders). P.S. This issue also impacts America’s Olympic athletes. P.P.S. And Santa Claus as well! She might also have to renounce her American citizenship before she marries. Otherwise by virtue of her marriage she risks bringing prince Harry’s income and property into the custody and taxation net of the American people. Regardless of timing strategies, if the de-Americanized Miss Markle ever wanted to return to America for an extended period of time (over ninety days), say to spend more time with an ailing elder relative, the American people may just deny her the tourist visa extension — especially since she’s a tax traitor. As a matter of fact the American people would likely deny miss Markle all visas as a tax traitor (see “Reed Amendment” –receiving bipartisan support when it was voted — way to go American people!). These are laws and language from authoritarian regimes most of which no longer exist! I’m wondering, if there were a referendum in America on the issue of international taxation and exit taxes, what would the American people vote? My guess is that they would uphold the current regime. Once voter lemmings find a way to extract wealth from a minority it is really difficult for them to let go. They just go down clenching their policies. All this reminds me that America’s economic freedom and resulting prosperity is more a result of historical serendipity rather than rational thought. As such, it is standing on shaky ground and could be easily lost. Simply justifying away the policy as a relic from a long gone Civil War era will not work. All indications are that the mentality is present and active in today’s American public. Although the international taxation regime is a potentially serendipitous historical relic from the Civil War, the decision to reinforce it with an even more vindictive exit tax is a very recent decision (*). A decision taken by America’s elected government. I assume a majority of today’s Americans agree with it. This does not bode well for the trajectory of economic freedom in America, and consequently does not bode well for America’s continued top prosperity ranking in the world. American international taxation of individuals is still a minor issue because, well, nine million expatriates are still a small minority — so who cares about them. When democracy says “pay” you only need to ask “how much sir(s)”. 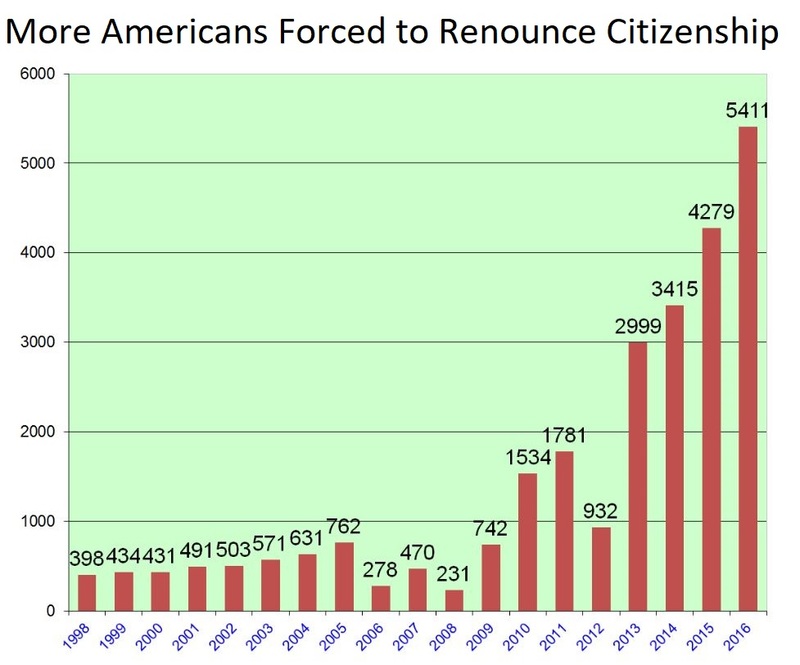 But I think it’s an issue that will balloon exponentially in the next few decades (and the citizenship renunciation graph already shows this nascent exponential behavior). As America’s growth rate now structurally lags the average world growth rate, America’s proportion of world GDP will continue to shrink at an accelerated pace. Rising coercive collectivism in America coupled with liberalization and faster rising prosperity in a few other parts of the world will create ever more American expatriates. Desperate American voter-lemmings will predictably attempt to hang on to their worldwide top standard of living by clamping down on the most competent and productive members of their society. This will create a tipping point for emigration whereby the most competent emigrate leaving behind an never dumber mix of ever more authoritarian and declining voter-lemmings. Tax reform, and perhaps a few other mildly positive developments in the next few years, may slow down this process but will not alter the final outcome. This final outcome and trajectory is something one quickly realizes by talking to today’s average American /voter. They are simply clueless about what created their past prosperity and therefore about the policies needed to maintain it. The proof is in the pudding — the (lagging) structural growth rate. (*) IRS code section 877 passed in 1966, and the exit tax imposed in 2004, then amended with more strict provisions in 2007 and 2008. Hence, this oppressive aspect of the American voter psyche is alive and well, not just a relic from two centuries ago.